Ramona Blue has been making internet waves well before its release date. A poorly written summary led readers to believe that Murphy's latest is about a lesbian who is "cured" by a straight male--that she finally meets the one guy who helps her see that she's been heterosexual all along! Well, let me put those worries to rest: Ramona Blue is not about homosexual-shaming in the least. In fact, Murphy's latest is a story of a young girl growing to realize that her sexuality is a lot more fluid than she originally thought it was--and a lot of other things in her life are, too. Ramona has always known exactly who she is. She's been out of the closet as a lesbian since the 9th grade, she's always been by her older sister Hattie's side, and she's been working multiple jobs alongside high school just to keep afloat. Ever since Hurricane Katrina devastated her small town in Mississippi and her mother moved out--and stayed out--her family of three has been living in a trailer park, struggling to make ends meet. But now, on the cusp of Ramona's senior year about to begin, everything is changing. Her sister is pregnant and the father of the child, Tyler, has moved in to their already too-small trailer. Her summer fling, Grace, is not yet out of the closet and, to make things worse, she's returning home to her boyfriend an hour and a half away. And, Ramona's childhood best friend, Freddie, is moving back to Eulogy, Mississippi. I loved this book. Ramona's voice is so easy to slip into and her group of friends is impossible not to love. 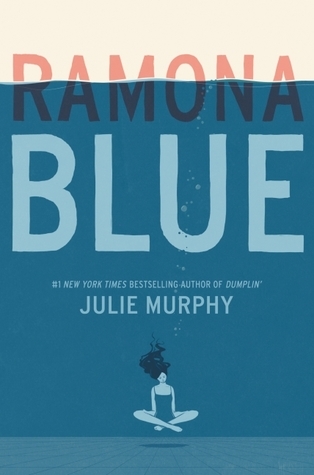 Ramona Blue charts Ramona's entire senior year, from its beginning to its end, and her growth over the course of the novel is remarkable. I love that Ramona feels so comfortable in her skin and in owning exactly who she is. When Freddie moves back, their friendship bounces back after years apart and I loved watching as he integrated himself seamlessly into her life and just fit in. Ramona doesn't lead an easy life--she's constantly working and can't help thinking of what her life could have been like if Hurricane Katrina hadn't wrecked it--but she makes the best of it and has pillars of support that get her through the toughest of times. I admired Ramona from the beginning, simply for her resilience and hard work, but I soon grew to care for her since she never bothered to care for herself. With her sister pregnant, Ramona is scurrying around to save money for the baby, help her sister get the prenatal care she needs, and is making plans for post-graduation--not to go to college, but rather to be there for her sister. It broke my heart that Ramona didn't see a future for herself past Eulogy, Mississippi and I wanted her so desperately to be selfish, just the once, and put herself ahead of her family. The family and friendship dynamics are all written so realistically, though, and I admire Murphy's sense of characterization--I despised Hattie for being someone Ramona was willing to give up her future for, but I also loved the bond between these two sisters. Freddie also becomes a huge part of Ramona's life, mainly because his grandmother and him encourage her to begin swimming at the gym and become such huge sources of support for her. But, Freddie is not only a best friend to Ramona--he's something more. And that scares her. She's never had feelings for a guy before, but Ramona knows she likes Freddie--a lot--and her journey to accept that and figure out any new label she might want for herself is written with aplomb. I especially love Freddie. Not only is he a swoon-worthy love interest, but he's such a good friend and I adore that he's a good guy to the core. We need fewer "bad boys" in YA. Ramona Blue faltered for me towards the end, when Ramona does a lot of quick growing up and makes a bunch of decisions about her future, all in the span of a few pages. I really needed to see Ramona put herself first, after being such a selfless friend and sister, and I didn't feel like I got that time with her to see her accept that it was OK to be selfish and have a future outside of Eulogy. I also really wanted more discussions of race. Freddie is black and he has a brief, but important, conversation with Ramona about how being black in the South is an experience she can never understand, but I totally wanted more of this. Murphy definitely sacrifices a few of these harsher conversations for a lighter novel, and she does do complete justice to Ramona's journey in discovering that she doesn't just like girls, but I do wish we had seen more of an explicit discussion of this, and even of privilege which is mentioned quite a few times but never spoken about by any of the characters. That being said, I was totally immersed in this novel from start to finish and surprised myself by how much I enjoyed it. I've never picked up anything by Murphy before, but this book just called to me and I'm glad I listened. Oh that blurb writer should be fired. I wouldn't have picked it up based on that. So glad you have given it a go and shared. I am now curious about the book and it sounds like a read I would enjoy. Brilly review! This is great book that I found on the weekends. After reading your review. I am so crazy about the novel and want to download eBook copy for me.